The International Energy Agency is a great source for current energy research. The IEA warned in its November 9, 2011 World Energy Outlook that nuclear energy is vital and remains the only viable solution to meet global energy needs. Energy pressures include demand growth from rising population and emerging economies, to higher prices for insecure and inefficient high-carbon energy sources such as coal, oil and gas. The IEA predicts $120 oil as China, India and others increase demand 14% by 2035. It could get much worse if Germany, Belgium and others cut back on nuclear power for more oil, or if expected worldwide oil investments and targeted output don't keep up for any reason. - The US Nuclear Regulatory Commission NRC has approved the restart of two nuclear reactors in Virginia, where a 5.8 earthquake hit in August. - Accounting firm KPMG advises UK to shelve wind for nuclear; to slash energy costs by 34 billion pounds, equal to 550 pounds for every person in Britain. Building wind turbines is very expensive; nuclear can also achieve carbon reduction targets at 1/6th the cost. - France's energy industry association says it would cost 50% more to reduce their energy mix from 75% to 50% nuclear, and CO2 emissions would go up 25%. Energy costs, CO2 emissions, competiveness, independence and safety of supply have led France to conclude it is not possible to replace nuclear. France has 58 reactors with number 60 expected in a few years and remains politically committed to nuclear power. - After Fukushima, Japan had suspended talks to export its reactors and technology. Last month during summit talks, Japanese Prime Minister Yoshihiko Noda agreed to have Japan work with Vietnam to develop its nuclear program - The Mainichi Daily News. Japan is also talking with India about exporting nuclear reactors and technology in the future. - A Wall Street Journal article entitled "Dalai Lama Sees Nuclear Power's Role", says he "supports using nuclear energy for peaceful means as a way to bridge socioeconomic gaps in developing countries in the absence of more-efficient alternative energy sources." An active voice against nuclear weapons, even the Dalai Lama understands that nuclear energy is the only viable solution to meet the energy needs of developing countries. We reiterate; has uranium seen its bottom? In last month's newsletter, "Fall Rally, Headline Risk vs. Long-Term Value, Uranium Bottom? ", I touched on (TSX: CCO)(NYSE: CCJ) Cameco Corp's $3.75 offer for (TSX: HAT) Hathor Exploration. On the day of posting, (NYSE: RIO) Rio Tinto announced a higher all-cash offer of $4.15 that was recommended by Hathor's management. My observation then was that the market might be signalling that the bidding may have just begun as Hathor's shares closed 6% higher than that latest bid. I also noted that this story is far from over and perhaps in a few months we will look back at Cameco's offer for Hathor as the Starter's Pistol of the next uranium bull market. To follow-up, on Monday November 14, 2011 Cameco upped its bid for Hathor, releasing the following self-explanatory news, "Cameco Increases Offer For Hathor To $4.50 In Cash Per Share". The increased $625 million all-cash offer expires on November 29 and represents an 8.4% premium over Rio Tinto's offer. Instead of having to wait for Hathor's review of Cameco's latest $4.50 offer, Rio Tinto fired back with another higher offer, announced on Thursday November 16th. Rio Tinto's latest offer of $4.70 per share, approximately C$654 million, is about 4% higher than Cameco's latest $4.50 offer. Rio Tinto's offer is open until November 30, 2011 and again has the support of Hathor's management. In case you are losing track, this latest $4.70 Rio Tinto offer is the fourth. "Hathor's main exploration properties are located within the eastern corridor of the Athabasca Basin which hosts all of Canada's producing uranium mines and accounts for approximately 23% of global production. Current mining reserves in this area exceed 25 years." - from Hathor's website. Hathor makes a lot of sense for Cameco that has been producing in this area for decades and wants to replenish reserves. They probably best know the area and what it's worth. On the other hand Rio Tinto seems to want-in to the area's high grades, but may need to build or buy its own production facilities. Strategically, buying Hathor seems to make as much sense for either Cameco or Rio Tinto. Both have a ton of cash and are established worldwide uranium producers. The all-cash offers so far seem clean enough that it should simply come down to the highest bid. The questions now are how much is it worth and who wants it more? It's difficult enough for shareholders and bidding companies to figure out the value of proven in-situ NI-43-101 compliant resources. The real trick is coming up with a share value for the whole company including the potential of underexplored nearby projects. In other words valuing long-term prices and production costs for a commodity that is still in the ground is one thing, and valuing potential projects is even more speculative. Valuing exploration potential is as much intuition and faith than science, until economic resources are established. A rational buyer will discount this risk as much as possible; but as multiple bidders emerge, the seller can often get more for both its proven as well as its potential projects. On November 22, Hathor announced, "Canadian Competition Bureau Issues Clearance for Rio Tinto's Offer for Hathor". But will there be more bids for Hathor? The market seemed to think so as T.HAT was bid up to an all-time high of $5.10 on November 23, 8.5% higher than the latest $4.70 offer, and 36% higher than the first $3.75 offer. However, Cameco's latest announcement appears to throw cold water on the hopes of those cheering for the bidding war to heat up more. Today's November 28, 2011 news release entitled, "Cameco To Allow Offer For Hathor Exploration To Lapse", states, "... it will not increase or extend its offer ...". Perhaps the real question now is ... who will be the next Hathor? (Amex/TSX: URZ) Uranerz Energy is one of our Featured Stocks that we have been following closely for almost a year. URZ is poised to become one of the first companies to open a new ISR uranium mine in Wyoming in over a decade. Uranerz has indicated that construction of its first ISR uranium mine would take 12-15 months from when it received its NRC materials license. This final NRC mine construction permit was received on July 20, 2011 meaning that much of this timing (whether 12 or 15-months) could simply come down to weather conditions. 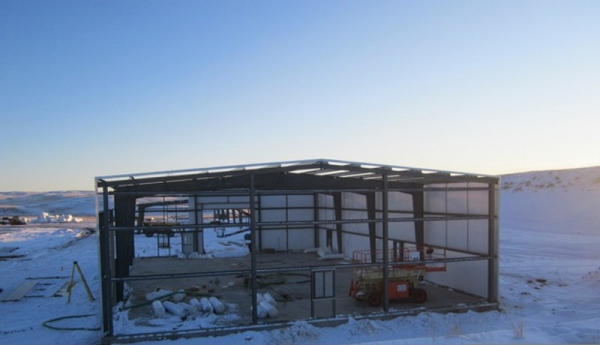 If the central processing plant's roof and walls could be built before the snow flies, then inside work on the office and laboratory could be completed over the winter - instead of waiting until next spring. 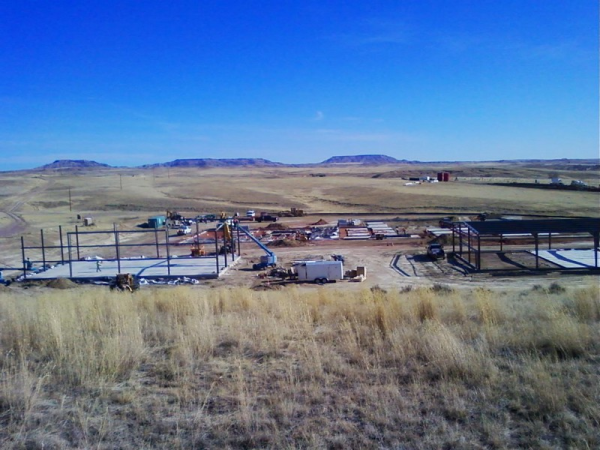 On August 1, 2011 Uranerz announced that construction of its first mine had commenced at its Nichols Ranch ISR Uranium Project, in Wyoming's prolific Powder River Basin: "Construction activities will consist of two main functions: building the central processing plant, including office, laboratory, and maintenance buildings; and installing the first well-fields. Site preparation for the central processing plant commenced last week. The locations for 75 environmental monitor wells are being staked and installing these wells will begin soon. Drilling rigs for installing the monitor wells and production wells have been contracted and are now being mobilized so that they can start operating later this week. Contracts for improving the roads leading into the site and contracts for the well-field header houses are also being finalized with material purchases underway. In addition, a 550-barrel cement silo is in the final fabrication process and should be delivered to the site in mid-August." Uranerz has estimated mine construction costs of approximately $35 million. On November 10, 2011 the company announced its third quarter financial results that still show over $40 million in working capital and no debt. This news release also updates activities at the Nichols Ranch mine construction site and its 2011 drilling and exploration programs. drilled a total of 186 uranium exploration holes for a total of 140,000 feet, with three drill rigs. Last month we showed a picture of the cement trucks lining up to pour the footers for the processing plant. The following three pictures were taken between mid October and early November. 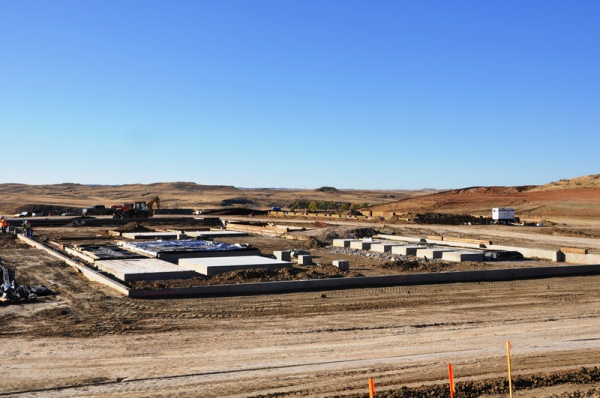 For the most recent photos of Uranerz Energy's Nichols Ranch ISR Uranium Mine, visit http://Uranerz.com/s/Photogallery.asp . It appears that the roof and walls may be weather tight any day now. This could put Uranerz ahead of schedule; perhaps ready to commence U3O8 production in Q3 instead of Q4-2012? Sign-up at InvestorsGuru.com for our newsletter or URZ's News by Email. Free! Good informative post. It’s always good to learn more about the stock market.